Point-and-click adventure game The Wardrobe will launch for Switch on July 6 and PlayStation 4 in late July, publishers MixedBag and Adventure Productions, and developer C.I.N.I.C. Games announced. It will cost $14.99 / €14.99. Pre-orders are available at the discounted price of $12.74 / €12.74. 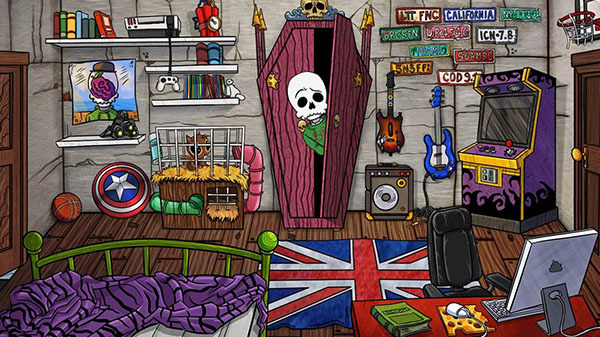 A visually-rich 2D point & click adventure game which pays tribute to the pop culture through a myriad of references. Inspired by the great ‘90s classics such as Monkey Island, Day of the Tentacle, and Sam & Max: Hit the Road, the game has a strong sense of humor and isn’t shy about dealing with mature and non-politically correct themes. More than 40 hand-illustrated and digitally colored locations, populated with more than 70 characters. Four types of actions for each hotspot and dialogues with multiple choices (full of funny answers to try)! Dozens of clever puzzles and many inventory objects to collect!